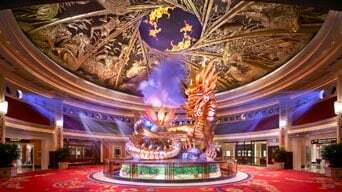 Symbolizing vitality, good fortune and well-being, the Dragon of Fortune dramatically combines traditional sculptural art, modern lighting and audio enhancements to stunning effect in the Rotunda atrium of Wynn. 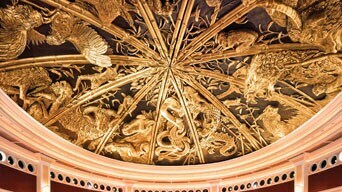 The Dragon - emerging from a rolling mist and rising to a height of 28 feet – features an animated head complete with glowing eyes and smoke billowing from its nostrils. The beautiful Lotus Blossom opens some 12 feet in diameter to produce an awe-inspiring crystal light effect.